Today Friday June 6 at 2pm EDT the first steering committee planning meeting for the forthcoming Internet Governance Forum USA (IGF-USA) meeting, scheduled for July 16 2014 in Washington DC. Remote participation in the meeting is available via webex. The meeting will also be webcast live via the Internet Society Livestream Channel. 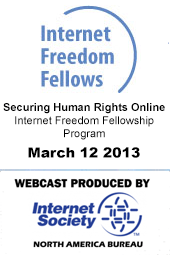 The Internet Society’s Washington DC Chapter (ISOC-DC) webcast live its discussion “The Latest Developments in Internet Privacy” Thursday March 29 2012. The archive is below.